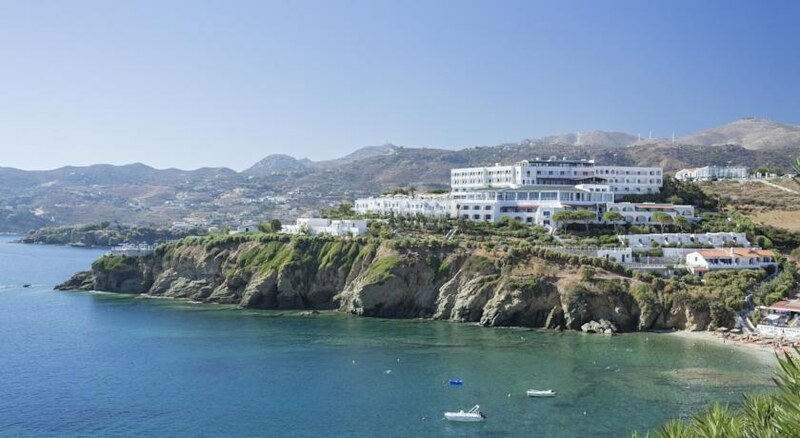 Hotel located on a headland above the bay of Agia Pelagia, 3,5 km away from the centre of the well known holiday resort and 300 m from the nearest shingled beach. The Peninsula hotel is built on a promontory in a traditional Aegean architecture overlooking the bay of Agia Pelagia and 20 km west of the island’s capital town Heraklion. The Peninsula Hotel is surrounded by two unique beaches that offer a wide range of water sport facilities. To the centre of the well-known holiday resort Agia Pelagia, with its numerous shops, restaurants, taverns, bars and cafes, it is 3,5 km away. A local bus service connects the hotel to the town and to the airport, situated 26 km from the property. The hotel facilities and services include 24 h reception. Stayed at the peniinsular hotel for 1 week in early september. Stunning, dramatic situaiton on the cliff tops with stunning sea views. Staff exceptionally friendly and helpful. Grounds are gorgeous and offers lots of places to sit and explore. Easy access to the public beaches on either side. Going into the town is a lovely walk but is hilly so recommend early or late in the day or when the weather is cooler as the walk back can be exhausted as basically all up hill in midday sun. Pools are great - preferred sea pool but more personal preference. When we were there, no problems getting a bed but this could been due to time of the year. Private beach was perfect as it allowed you to avoid more crowded beaches and although limited bar service was included, still plenty on offer. The best thing about the private beach by far was the fish in the water - would recommend a snorkel! Food was always good just sometimes not exciting but for mass produced food always hot and wide selection - just wish they did more local dishes and more variety some days but again personal preferences. Cannot fault quality of the food though. Would not recommend the hotel to people with mobility issues or those who struggle with steps as you are constantly up and down stairs. Also not a family hotel - although pools and food could suit kids it is a hotel with couples and older people and everything is geared to them - basically those who want to relax, read and laze around so kids would most likely become frustrated as not cattering to them at all. Saw reviews about the french holiday club but they did not disrupt the holiday at all - and they really made an effect to include non french speakers if they wanted to join in. Did not dominate the day at all though. Would also recommend a day at the water park for people who like them - spent an entire day there - hotel organised for us and was a cheap option when you looked at cost of taxis. Would happily go back tomorrow and very much recommend to anyone looking for a relaxing holiday with stunning views but enough to do locally.